Border Collie Characteristics: The super intelligent, lively and persistent Border Collie is a breed of medium sized dog, classified as a member of the Herding Dog Group (AKC:1995). The Border Collie is ranked Number 1 in the Smartest Dog List. The Border Collie, is characterized by its well balanced appearance with a broad head and a keen expression. Other characteristics include wide set, oval-shaped eyes; medium sized eras that can be dropped, semi-erect or pricked, an athletic body and a fluid, tireless gait. The temperament of the Border Collie can be described as Energetic, Responsive, Tenacious. The coat type of the Border Collie is described as medium length, dense coat in assorted colors. Due to its characteristics and qualities, the Border Collie demonstrated the desired traits of a Watch dog and Farm Dog and is known simply as the Sheepdog or by its nick name the "Trainers Dream Dog". The origin of the Border Collie dog breed was in United Kingdom where it was developed in the end of the 19th century. Border Collie Breed Group and Dog Type - Herding Dog Group (AKC:1995): The Border Collie is one of the many breeds of dogs that belong to the Herding Dog Group (AKC:1995). Other names for the Border Collie: The Border Collie is known by the nickname of the "Sheepdog". Other names for this breed of dog include the Trainers Dream Dog, Scottish Sheep Dog and Scotch Sheep Dog. Origin of the name Border Collie: The origin of the name "Border Collie" derives after the place it was originally bred in the border lands between Scotland and northern England. The old English word "Collie" dates back to the 1650s from the word 'coaly' meaning "coal-black in relation to dogs or sheep with areas of black on the face and legs". The confusion between the two separate different breeds, the Border Collie and the Collie dog (the Lassie Dog), arose because the word 'Collie' became synonymous with any sheepdog. What is the difference between the Border Collie and the Collie? : The Border Collie originated from the far north of England, near the Scottish border - the Collie (known as the "Lassie Dog") originated further south. The Border Collie is generally smaller, has a shorter coat and has a higher level of intelligence than its counterpart. The Border Collie is the Smartest Dog in the World: The Border Collie is deemed to be the smartest dog in the world by canine experts - which is why it is known by the nickname of the "Trainers Dream Dog". The skills of the Border Collie are legendary and the breed is highly valued on farms where they help the farmers to herd their sheep at the sound of their owner's signals, recognising short voice commands and differentiating between a series of specific whistles. The Border Collie has the ability to problem-solve and work independently or in conjunction with the shepherd. Border Collie History and Origin - The Romans and Vikings: The country of origin of the Border Collie breed was in the English-Scottish border lands of the United Kingdom at the end of the 1800's. The Border Collie was once simply referred to as simply the Sheepdog and is renown for influencing sheep with its intense stare, stalking ability and its uncanny ability to second guess where and what the sheep will do next. Using its problem solving skills the Border Collie would react accordingly, containing, collecting and bringing in the sheep. The earliest ancestors of this herding breed date back to the Peat Dog (Canis familiaris palustris) of ancient times. the Border Collie is also a descendent of the herding dogs of the Romans were cross bred with the Spitz-type dogs who herded reindeer for the Vikings. These obedient and highly intelligent sheepdogs were utilized over the years to herd sheep over rough and mountainous terrain. Border Collie History and Origin - "Old Hemp" the father of the breed: The modern breed of Border Collie was developed by Adam Telfer of West Woodburn in Northumberland. Adam Telfer wanted to develop a quieter sheepdog and used his favorite working dog and herder "Old Hemp" (September 1893 ? May 1901), who was calmer and quieter than other sheepdogs, as the basis of the breed. Old Hemp was such a good, faultless sheepdog that many other farmers in both England and Scotland wanted pups sired by by him. "Old Hemp" had more than 200 offspring and is considered the 'father' of the Border Collie breed. The fame of the tireless Border Collie, the quintessential sheepdog, spread across the world. The Border Collie was, and still is, particularly favored for herding huge flocks of sheep in countries such as the United States, Australia and New Zealand and has earned the distinction of being the best herding dog breed bar none. 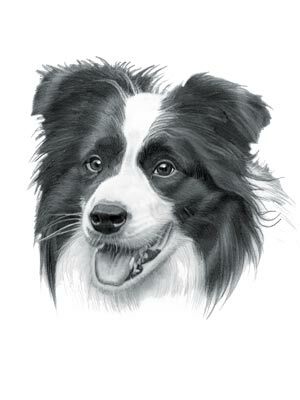 Border Collie History and Origin - "Old Shep" the Forever Faithful Dog: One of the most famous of the Border Collie breed was an American dog called "Old Shep" from town of Benton in Montana. The shepherd who owned the 'Forever Faithful' Border Collie dog, died in 1936 and his faithful dog watched as his master's coffin was put on to a train to return to his family. The dog met every incoming train hoping his master would return. The train station staff adopted the Border Collie dog which they called "Old Shep". His devotion became famous when two years into the watch, "Old Shep" was featured in Ripley's Believe It or Not. Old Shep was killed by a train in 1942 and was buried on a hill overlooking the station, where a memorial in the form of a bronze statue to the faithful Border Collie was erected. The most famous British Border Collie was a pet dog called "Shep" (1971?1987), who was loved by the children who watched the 'Blue Peter' TV show. Shep was inseparable from his owner and presenter John Noakes. Border Collie Modern History: The Border Collie was officially recognized by the American Kennel Club (AKC) in 1995. The modern history of the Border Collie moved on and the breed is still used as a herding dog and a much loved family pet. In recent years the Border Collie has also been employed in helping humans as a Search & Rescue dog. Border Collie Height: The Border Collie breed is classified as a medium sized dog. The height to the shoulder of a male dog is 19-22 inches (48-56 cm). The height to the shoulder of a female dog is 18-21 inches (46-53 cm). Border Collie Weight: The weight of the male in this medium sized dog is 30-45 pounds (14-20 kg). The weight of the smaller female dog is 27-42 pounds (12-19 kg). Border Collie Coat Type: The coat type is described as medium length, dense coat. Border Collie Coat Colors: The colors of this dog breed consist of assorted colors consisting of Black, Gold, White, Blue, Red, Chocolate, Red Merle, Sable Merle, Blue Merle, Brindle, Sable and Liver. N.B. Brindle is a brownish or tawny color. Sable is a dark brown color. The term "Red" refers to reddish shades of orange, brown, and tan colors. Merle describes the mottled patches of color in a solid or piebald coat. The word "liver" signifies any shade from yellow to brown. Border Collie Grooming - MODERATE Grooming Needs: The dog grooming needs of the Border Collie is not extensive and therefore categorized as Moderate in order to maintain a healthy coat, reducing the risk of skin infections. The modest grooming needs of the Border Collie is considered to be mid-maintenance requiring weekly brushing and combing. Dog Grooming Requirements should include bathing the dog on a monthly basis and making regular inspections of the teeth, eyes, nails and ears. Border Collie Litter Size: The litter size of this dog breed ranges from 4-8 puppies. Border Collie puppies for sale can be obtained reputable breeders and from rescue centers. The cost of Border Collie puppies varies depending on location, pedigree history and the dog breeder. Border Collie Temperament and personality: The temperament and personality of this popular dog breed is described as Lively, Energetic, Responsive, Tenacious and Persistent. Border Collie Exercise Requirements - MODERATE Exercise Requirements: The exercise requirements of this breed of dog are moderate. The Border Collie requires regular daily exercise consisting of about one hour every day. This medium sized dog has a strident, fluid, tireless gait with strides of a moderate length requiring a steady walking or jogging speed by the owner to meet the dogs exercise requirements. If the dog has more energy than you do, then teach your dog to play ball in a chase and catch game. Border Collie Diet: A fully grown Border Collie should be fed twice a day. A diet consisting of a premium dog food can be balanced with fresh food eaten by the family. The question is What Can Dogs Eat?. Check out our comprehensive list of what dogs can and what dogs cannot eat. Border Collie Health Problems: Potential health problems of the Border Collie breed include Joint problems, Eye problems. Resolving health problems can prove to be expensive and it is always wise to obtain pet insurance or dog health insurance when buying a dog. Is the Border Collie dog breed said to be Hypoallergenic? Answer: No. Border Collie Lifespan: The life expectancy of dogs vary according to the size, breed of dog and any serious health problems. The typical lifespan of the Border Collie breed is 12-15 years. Border Collie Male Dog Names: Male Dog names are most often chosen to reflect favorite names of the owner or the strength, size, coloring and country of origin of the Border Collie breed. To give you some inspiration regarding good male Border Collie names our small selection might be of help with naming boy dogs. Our top male dog names are: Festus *** Felix *** Gaius *** Gideon *** Jock *** Mac *** Rogue *** Sabre *** Buddy *** Jake *** Rocky and Shep. Border Collie Female Dog Names: Female Dog names tend to be softer, prettier and reflect the temperament of the girl dog. Our top choice of good female Border Collie names are Vicki *** Flora *** Abby *** Phoebe *** Reba *** Candy *** Dinah *** Venus *** Mara *** Persis.